As you already know, I am passionate about marketing. So now, I would like to dive in deeper into marketing techniques and SEO in particular. DIfferent companies pursue different SEO strategies, and some do nothing. However, nowadays, there is no way a company can survive without aggressive and wise marketing strategy, including the SEO strategy. Going further in my studies and work, I realise how much companies lose, if their SEO strategy does not exist, or if it has some flaws. In this case, for the research for my project, I choose Honest Tea Company as an example to play with SEO results and analyse how they may influence Honest Tea Company. Honestea.com is ranked 759,329 in the word among 30 million other domains. The website is popular among users in the United States. It gets 80.1% visitors from the United States. The website has a quite high SEO score: 37%. Now to the more important part: The website uses the following search keywords: tea, fair trade, bottled tea, organic tea, organic bottled tea, Seth Goldman. Also, it has 1,278 backlinks, which all in all are components of great SEO strategy. Recent SEO trends show, that if you are rationally using backinks on your website, your SEO results will jump up higher than if you use any other techniques. In this case, the company has an amazing strategy and the statistics show that. 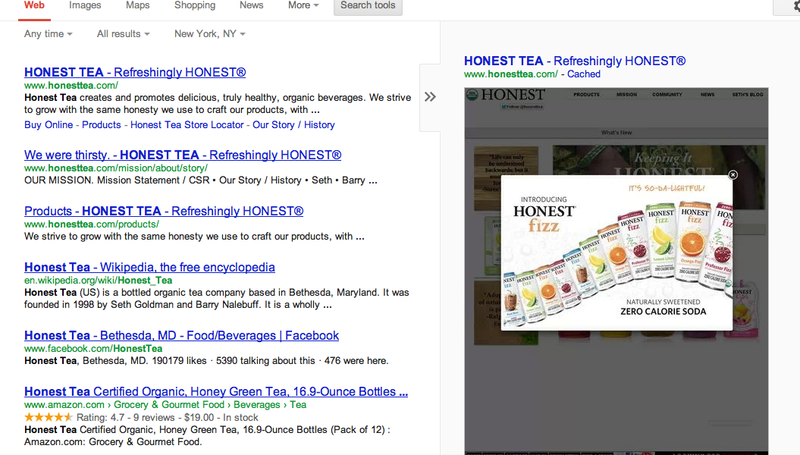 However, Honesttea.com does not use Google Ads. See below. I thought this could be considered as a flaw. As the guest speaker at the NYU, Gracey Newman said, Google Ads are important to pursue. Using Google Ads improves the chance that your link will be clicked on. Even if you appear close to the number one in the organic search, if you have a Google Ad, you will have a chance that someone will notice it before noticing your company in the organic result. They have a flash banner all over the website when you open it. Personally, I would not pursue this strategy because I would like to see the whole website when I go to the website of the company. This preview tells me that they currently promote this product right now and that is why I have to see it. All in all, it is a good technique to use SEO for your company, but also companies should use it wisely, because it is up to the company;s customer to decide whether to click on the page or not. This was my first post on SEO, that is how you know I am only learning. I will be looking at other companies in the next weeks. How does Honest Tea deal with user friendly part of their website? It is time to look at the legal side of advertising, folks. ← I know how I fascinate, what about you?